Network Rail is bringing forward plans for a new railway sleeper manufacturing facility in Bescot, Sandwell in response to the need for a new facility in Britain. The site is located within the Bescot Sidings Freight Yard which is a major freight yard in the West Midlands. We have now undertaken two rounds of engagement on the proposals. The first was held in early 2018 and invited comments on our original plans. Following this, the feedback was internalised and we sought further comments on our revised proposals across March and April. We will now review all of the responses ahead of a planning application being submitted later this year. Regenerate the freight yard to support on-going operations, deliver the manufacturing facility and enable further inward investment. The facility will also enable Network Rail to source a wide variety of technically advanced products within a secure commercial framework. The storage area will enable peaks in demand to be managed and provide security against unforeseen events that force unexpected demand on Network Rail. Our plans for a new railway sleeper manufacturing facility will secure up to 100 new jobs in the West Midlands, whilst supporting the critical delivery of Britain’s Rail Upgrade Plan. The delivery of this facility is crucial to allowing Network Rail to continue safely running, maintaining, renewing and enhancing Britain’s rail network. At present, sleepers are sourced from two locations in Britain – Doncaster and Washwood Heath. 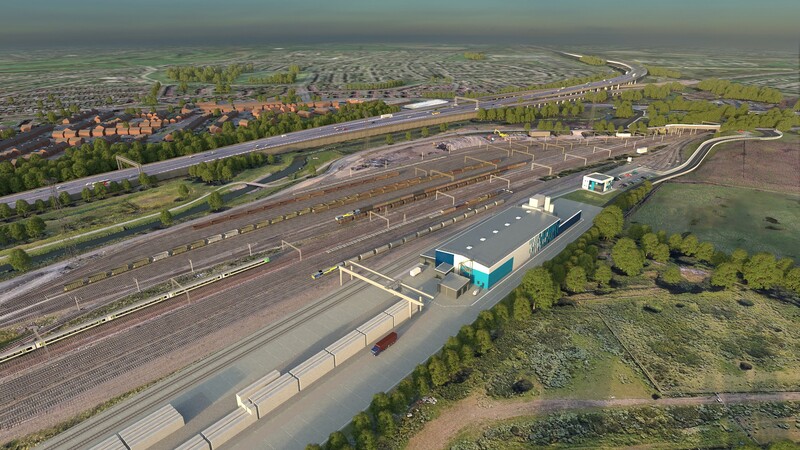 However, due to the upcoming closure of the Washwood Heath facility to accommodate a HS2 hub – in turn boosting the West Midland economy – we must urgently establish an alternative facility to make up for the shortfall in production capacity. Following a thorough site selection process, the site at Bescot Sidings Freight Yard has been identified as the preferred location which will deliver both local and national benefits. It is a brownfield site which has excellent connections with national rail and strategic road networks. It’s located in the heart of the railway and will allow us to manufacture and distribute sleepers across Britain by rail, to support rail improvement works. This is better for the environment. This, coupled with a more efficient manufacturing process and a reduction in logistical costs will save taxpayers millions of pounds during the life of the facility. A revised traffic management plan. The route for vehicles has been amended, with vehicles arriving at the site via M5 J1 and vehicles exiting the site via the M6 J9, to halve the number of vehicles using each part of the route. Please note: The facility will not be manufacturing cement. It will be making concrete to be poured into moulds to produce the sleepers. Whilst the existing sidings are currently operational 24 hours a day and the new facility will produce sleepers 24 hours a day when at full capacity, outside operations will be limited to between the hours of 07:00 and 23:00. The facility will not operate on Sundays. We’ve moved the facility 600 metres south eastwards, so that it’s not directly adjacent to any residential properties. The facility is now 250m away from the nearest residential property. The production facility is now 700m from Sussex Avenue and 500m from Kent Road. Housing in these streets are now 150m away from furthest travel of the crane. The revised location of the new facility also offers a better opportunity to screen it from public views from the areas to the south of the site. It’s proposed that an earth embankment / bund will be formed along the site’s southern boundary and this will be enhanced by extensive landscaping and tree planting. The access road and the area next to to Friar Park Road and Sandy Lane will also receive substantial tree planting that will mean the facility is visually discreet. We’re proposing a new link road between Sandy Lane (to the north of the railway) and the A4031, Walsall Road. This road will enable traffic accessing the facility, including traffic currently using the existing aggregate yard, to avoid using any residential or estate roads in Friar Park. This will improve traffic flows from Sandy Lane and Friar Park Road and prevent congestion at the relevant junctions. Furthermore, the route for vehicles has been amended, with access to be taken from M5 J1 and leave to M6 J9. This is to ensure that the access and egress routes are not shared, thereby halving the number of vehicles using each part of the route. The proposed access strategy would also prevent HGVs serving the facility from having to make right turns across traffic. Walstead Road and the Yew Tee estate/The Delves area will not be part of any traffic routes. We will achieve this by implementing a route management strategy which will require drivers accessing the facility to only use approved routes. This will be activity monitored during our operations. The design of the manufacturing process already includes many noise attenuation and isolation measures. We’ve challenged our designers to look again at what additional measures can be incorporated into the proposals to limit the impacts of noise. A series of recommendations have been made, including modifications to the production process and designing an acoustic screen to shield the delivery space and prevent the transmission of any noise from that space towards adjacent premises. Any processes that can generate noise and vibration will take place within enclosures. This will isolate the noise from the production space and there are lockouts which mean this process cannot be undertaken without the enclosure being in place. The respective equipment is also set on independent mountings which prevents the transmission of vibration into the surrounding structure or environment. Network Rail doesn’t expect any significant issues from dust and there will also be no silica emissions. There should be no problems associated with dust arising because of traffic from the development as all the surfaces will be sealed and the delivery of raw materials will be in enclosed trailers or sealed tankers. More information about dust will be presented in the Environmental Statement which will be submitted alongside the application. It’s proposed that the area for the sleeper storage will be located to the north west of the production building, within an area that is currently used as railway sidings. The storage area would be at least 150 metres away from any residential properties and the maximum height of the stockpile will be limited to 5.4 metres. The storage area would be served by a travelling crane which will run on a 14 metre gantry. Cranes at similar facilities in Germany make no noise, have no beacons and we will seek to emulate this operation, subject to risk assessment and a safe system of work. The ridge height of the production facility would be 13 metres high. The silo/batching plant which is located to the north east of the manufacturing facility would be approximately 20 metres high. The area around the buildings will be landscaped and wildlife encouraged through seeding, planting and habitat creation etc. An Ecological Survey has been undertaken by the development team to evaluate existing habitats and species on the Bescot site. The findings of this will be presented in the Environmental Statement which will be submitted alongside the application. This survey has informed our revised proposals and the area around to the south of the buildings will be landscaped to encourage wildlife through seeding, planting and habitat creation. A detailed Flood Risk Assessment has been prepared by the Development Team and engagement is on-going with the Lead Local Flood Authority and Environment Agency in relation to the proposals and proposed scheme of sustainable drainage. Call the dedicated Community Information Line on 0844 556 3002 (Monday – Friday, 09:00 – 17:30) or contact Network Rail’s 24-hour National Helpline on 03457 11 41 41. Write to us at PO Box 5555, Manchester, M61 0SR. The feedback recieved during our most recent phase of engagement will be reviewed by the development team ahead of a planning application being submitted later this year.